This blog gives you an insight into Cover Orders. A Cover Order is an order which is placed along with a compulsory Stop Loss Order. In a Cover Order the buy/sell order can be a Limit/Market Order and is accompanied with a compulsory Stop Loss order, in a specified range. This Stop Loss Order cannot be cancelled. Since the Stop Loss Order is being placed simultaneously, while getting into the contract, the risk that is being taken automatically reduces. Because the risk reduces, the margin requirement also automatically reduces. Remember that all cover orders (CO) will be automatically squared off around 3:20 PM and hence this is a good tool for Intraday traders only. Zerodha Trader allows placing Cover Orders for NSE/(Equity, F&O & Currency) and MCX (Commodity). Discipline: Placing a Stop Loss while Intraday trading is very important and most traders usually keep a SL in mind rather than on the System. Even if you place a SL order, you are most likely cancel them rather than keeping them on the system. While placing a Cover Order, you have to compulsorily place a Stop Loss Order within a 1.5% range from where you are entering the stock/contract and cannot cancel such order. This way you are also limiting your losses, if any. The SL order can be modified, but within the 1.5% range itself. Higher Leverage:The compulsory SL limits your losses, reducing the risk and hence we can offer much higher intraday leverage compared to intraday orders placed using MIS. You get upto 20 times for equity, and upto 7 times for F&O. Cover Orders are meant only for Intraday traders as all Cover Order positions are squared off around 3:20 pm for Equity & F&O, and around 4.30 pm for currency. Margin required depends on the stop loss price you mention. You cannot carry forward cover order positions to the next day. Check out the Margin Calculator for Bracket/Cover orders. To place a Cover Order, click on the contract and click Shift + F1 (for placing a buy CO) or Shift + F2 (for placing a sell CO). You can also access the Cover Order from the “Orders and Trades” menu on Zerodha Trader. If you are not able to see the option, it means that the Cover Order facility is not enabled for you. Call us on 080-40402020 or email us at [email protected] to have it enabled. You can refer to the below snapshot to know how to place a Cover Order. **IMP** To exit a Cover Order position, you need to go the order book, click on the pending SL and click “Exit” as shown in the pic below. This is the only way you can exit Cover Orders. You cannot partially exit a Cover Order, they have to be entered and exited in a single order. 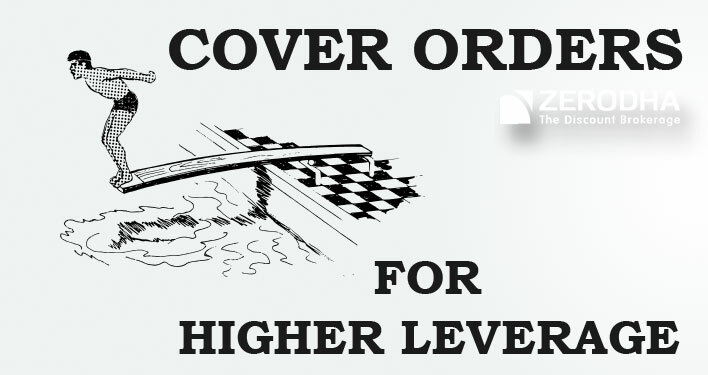 Cover orders give you higher leverage by ensuring that you place a stop loss. This is beneficial only for intraday traders. Margin requirement is 25% of overnight margins for Index/Equity futures (not for option trading) and for Intraday Stock trading you get 2 times the margin benefit that you get for Intraday Trading using MIS as product type. Positions can’t be exited partially and the only way to exit positions are from your Order Book (F3) by selecting the pending Stop Loss order and clicking on “Exit”. Cover orders are allowed for trading commodities. Cover orders for both option buying and writing. For option buying (only Nifty and Banknifty), you get 140% leverage that means to buy an option at Rs 100 you need only Rs 70. Maximum SL is 20% from your buying price. Can i modify a CO to a normal order? In bracket order 20 ticks means 1 point in Nifty. For stock futures like Axis bank 20 ticks mean how much? Does the value of ticks vary for each stock future ? How much is 20 ticks in Bank Nifty ? Can you please clarify? I was not using bracket order as I was not clear on the above aspect. 20 ticks is 1 point for all of them. when I searched In Kite iam getting Only future Quotes in market watch for Commodities . Ex: crude oil fut . since There are Different charts for futures and equity …. Nawaz, on commodities exchanges only futures trade. The underlying similar to equity on stock exchanges don’t trade. So yeah, you will have to look at crude oil futures charts. Today I place a bracket order but rejected for lack Margin but when i check in margin calculator only few thousands required and I have sufficient fund . Please check my account and tell me . The margin requirements are dynamic, and in the case of BO, would also depend on the stoploss you enter. The margin calculator only shows margin requirements as of the previous close. Always better to have more money as a buffer for these trades. It is requested to provide exit with limit price features in cover order. Sir, it my suggestion to implement in cover order to exit at desired value in market and to minimise loss. I can not understand how to use trailing stop loss ? Please explain with an example using by Zerodha Kite. Can you please update articles showing latest screenshots and references using KIte and Pi. Yogesh, have you checked this youtube playlist and this Kite user manual. 100 share @ 100 Rs. So i think you come to about the trailing stop loss. is it possible with CO if I have to maintain 5000 stop loss for gold mega? and I have only 10000 on my account. Sir, I am facing problems with cover orders…from this 2-3 months while I put cover orders they immediately got rejected …saying that ….first leg of cover orders already got rejected…can u pls describe this ? No it is not possible to convert, you will have to exit the cover order position and re-enter using a normal order. NITIN JI IN COVER ORDER CAN WE PLACE SL IN DOUBLE QUANTITY TO REVERSE THE TRADE????? 3. My guess is that you are putting trigger price wrong. Check our post on SL orders. Thank you sir, i am very happy to see your quick reply. I have never seen like this. Can ZT OR PI run on a Windows based tablet or mobile? ZT/Pi won’t run on tablet. Have you tried our new web app kite.zerodha.com? It is quite sleek. I placed a ‘Buy’ cover order on LT today at approx 1691 and trigger price as 1680. The stop loss order got executed within a minute at 1679.5! whereas the price never reached that point, the least it dropped to was ~1686. My understanding is that a stop loss order will get sent to the exchange only when the trigger price is breached. The order was placed at 14:02 on Wed April 5, 2017 however, you can check that the price never went below 1686. So, how was this order executed? Should it not have waited for the trigger price to be breached, before sending the order to the exchange? I have already sent my request to support and have not received a response yet. I have answered this here, check it out. Thank you, Nithin. That explains it. I would love to execute cover order trades or at least always have a stop loss order open for each executed trade. So, how do we avoid a situation like this without having to forego a stop loss order? Any ideas? Hmm…very tough. If you have stop set in the system, these freak ticks can hit it. To use NSE mobile app, you will have to migrate from Pi/Kite to NOW. On NOW you will not be able to trade any other exchanges than NSE, give a few days we are launching Kite android. Hi Nithin, Could you please advise how to do this? Do you want to migrate to the NOW mobile platform? at 11:30Am Price Rises To 82 ..Now Iam In Profit of 2 Rupees , Imeedaitely I want to Exit With The Profit..
1 . Can I Close the Trade at 11:30 Am ? 2.Is There any Minimum Day Or Time Is Required To Close The Trade With Profit ? 3.How many Futre Trades in a Day I can enter and exit Say Scalping ??? 2. Not at all, you can exit the very next second after entering a position. 3. No limit, as many as you want. 1.By the End Of the Day Price Reaches to 75 , Is it Going to affect My Balance ? 2. OR Wat Ever The price going UP Or DOWN My shares Price stayes at 80 Rs? 3.What Happens If the Price Goes Down to 15 Rs ? 4.What is the maximum time i Can Hold No of Shares In DMAT Account ? 5.When I Buy shares through CNC Are my shares trasferred automatically to DMat account OR i need to follow any procedure to get Transferred shares to My dmat account ? 1. You have already paid Rs 8000, so account balance will reduce by 8000. What price market closes won’t affect your account balance, but it will mean lesser value of your holdings. 2. Yes, your buying price is 80. What happens after that is immaterial to your account balance. 3. Your holding value decreases by Rs 15, there is no chance of auto square off since you would have paid the stock paying entire money. 5. Automatically transferred to demat. I try to place cover order By analyzing charts which are On the Kite , But when Ever I try to open the Pi and Kite simultaneously …Pi or kite Closes Automatically ……. What should I do In order to Place cover order On Pi By analyzing charts On Kite ? Cover orders will start on Kite in the next 10 days. Whether the CO facility is available on browser based platform, if yes than can you please guide on that. Currently it is not, but we should have it by this weekend on Kite. Not yet. There will be an update to Kite mobile which should allow you to place BO/CO orders soon. Not available, but very soon. Suppose I have 50K can i order 5 lot (250 qty)of nifty future ? 1. In first example image shown 3% of SL but where you clearly said SL limit is within 1.5%. 2. Since I am an Option Trader, it is very useful for me to limit my SL. But why not its possible for Option buying rather than Option writing ? @Pradeep, When you use Cover orders, you have to enter market order and exit market order, even the SL is a Stop loss market order. with 50k you can actually buy 7 lots. 1) Can i modify the stop loss in CO – Covered Order. Yes you can modify SL in CO, but only to the extent that is mentioned in the SL range that is given while placing the order. @Kumar, Have made the change, was using 1.5% as an example. The range will be specified when you are placing an order. 2. As you know, options can loose value really fast and giving leverage on option buying is a very risky business for the broker. Yes intraday leverage available if you are using the product type as MIS. You will require only 40% of the overnight margins, check out our SPAN calculator to know option selling margin requirements. I have doubt regarding intraday trading. If i short sell (intraday) can i keep it for T+5 Days? As Edelweis brokerage firm providing facility like, in an intraday trading assume stock of “XYZ” is 100 rs, then they provide Exposure 4 times along with holding position for T+5 Days. Please clarify any facility like this in Zerodha ? If so, please tell me , such that i can utilize that privilege. Nagesh, we provide leverage only for intraday and not for delivery. Also all your short sell positions have to be covered by end of day. Z,my q is,does the sell amount have to be less than buy otder,fr eg lets say i am buying 1 share at 100,now in the CO window will i have to place the sell amount as 99(less than 100,a sl order)or can i put 101(which will b like profit booking)?also can v do this in mcx? Hi, If i want to buy/sell 10 Lots of Stock Future How much Margin Require in my Account. Hi, If i want to buy/sell 10 Lots of Crude Oil MCX How much Margin Require in my Account. Ambarish, The Sl trigger price has to be in the range that is mentioned on the cover order, so you cannot use it the way you have mentioned. MCX presently not enabled, but should be up soon. MRP, commodities presently not allowed, but as an example for stock futures: Reliance lotsize: 250, price: 850, Total margin as per SPAN file : 33000. If you use MIS as product you need 40% of this: Rs 13200 and if you use CO you need 25% of this which is Rs 8250. Thanks Nithin,This Reliance example cleared my doubt on margin requirment for CO.
@Param, entry and exit has to be market orders for CO. So when the price goes to 102, go to your order book and press on the SL that is placed and click exit. The contract gets sold at market price..
if i wnat to buy 1 lot of rcom fut @ 74……… what is the aexact amount required by me to place a cover order….. if you can tell this i will calculate for others sir……. we can place stoploss and it will be squared off automatically fine….. but how to square off the order when we think the profit is enough…… and one more thing what is the brokerage same as others… that is.. 20Rs/trade or 20Rs/lot…………. is MIS applicable for option trading also……. is it applicable as same for shorting the PE and CE also…. I have got all points except, what if i want to modify my sl to higher level, for eg if i am making profit and i want to increase my level of sl, is it possible or only option is to exit and take profit. I think you cannot modify the SL value. The only way is to exit and take the profit. to know more about margin. if i buy futures of a stock can i sell before the expiry date. can i trade cover order on currency trading?if enable what will be require margin for 1 lot of USDINR contract. can i place Cover order on currency segment.please answer my request. @Tharun, Cover order is an intraday product, so if you buy/sell you have to exit before the end of the day. If you intend to keep the futures till expiry, you need to buy futures under product type NRML..
@Mr Singh, presently we haven’t enabled cover orders for currency and commodities trading, but this will be done in the next couple of weeks. If i want to keep futures till expiry date i should require the total amount shown in span margin file? i think cover order trading is more important for day traders,so please make sure to enable cover order on currency trading segment.thanks for your confirmation. Please enable cover order in the Currency segment, Also please consider MIS in the currency segment. Yes Tharun, you would require the margin amount as mentioned under total amount. Also when you buy/sell use the product type as NRML. you told me cover order on currency segment will be enable very soon,please can you hint how long it will be take and when it will be enable. I AM ONLY CURRENCY INTRADAY TRADDER,I LIKE COVER ORDER ON CURRENCY.AND I WANT TO OPEN ZERODHA ACCOUNT FOR CURRENCY TRADING,SOME TOLD ME THRER HAS NO INTRADAY MARGIN LIVERAGE FOR CURRENCY TRADING ON ZERODHA.BUT,IF COVER ORDER IS APPLICABLE I WILL TRADE ON ZERODHA. CO is good move by zerodha. Can we have one more feature in which we can place stoploss and profit target both. When profit target is hit stoploss atomatically gets cancelled and vice versa. So because of this feature we need not to manualy cancel the other order once its counterpart is executed.This feature I saw in plus500 trading platform. Cover order on Zerodha Trader is allowed only on NSE/BSE Equity, F&O and Currency. Presently it is not available for Commodities. I find this statement but accually the same is not available on OPTION WRITING and CURRENCY segment,here i don’t understant what your statement says.Please clarify. @Hemar and Surya, For buying options, even if you use cover orders you don’t get any margin benefit. But you can use cover orders for writing options and you will get the margin benefit. The only issue with using cover orders for option writing is that the SL range is 1.5%. so for eg if you write an option at Rs 50, you have to put a SL within the range of 50 to 51.5 which is a pretty narrow range for option trading. @Sudhir, the feature where one order cancels the other automatically is called a bracket order. Presently the stance by NSE is that because it cancels the other automatically it is an algo order and presently not allowed for retail clients..
Once you trade on BE, you have to wait for delivery which takes 2 days. So if you buy on 4th which is the T day, you can sell it on T+2 days, 7th Jan is T+1(as sat and monday holiday), 8th Jan T+2 , so you can sell from 9th Jan onwards.. I want to kbow that if i purchase stock ÇNC. And it is showing order complete. Then can i sell it on same day ? Or should i wait for t+2 day to sell it ? You can sell it the same day using CNC itself. It will be considered as an intraday trade. suppose nifty option29 oct 15. 8150ce ltp is 100. i want to short sell then what is my sl ?? For cover orders, you can choose any SL that you want within the range that will show up on the cover order form. There were 217 scrips available for margin trading before. But now your new margin scrips list with cover order shows only 156. For example Jet airways is excluded in your new list but unknowingly I made a cover order on 05 Jan 2013 and that order got executed. Do you give any leverage still for those excluded scrips for the cover orders? You can trade on CO only for stocks which we allow intraday margin. Jet airways is on that list, you will see the updated list on our website in the next couple of days.. Intraday margin scrips list for CO is not yet updated but your system allows to trade non listed scrips too. If i want to buy futures under normal it is mandatory to buy the whole lot or can i buy half the lot? Yes futures have to minimum bought 1 lot, you can’t buy half lot..
TILL TODAY IT IS NOT ENABLE TO TRADE COVER ORDER ON ZERODHA CURRENCY SEGMENT.IT IS VERY IMPORTANT FOR INTRADAY TRADER.WE ARE WAITING FOR YOUR COMMITMENT. It might take a couple of weeks more before it is allowed.. Cheers. What does strike price mean? if buying in NRML it effects anything? you told me CO on currency trading will be enable shortly.and aslo i like to trade CO on commodity segment,when it will enable to trade CO on commodity also.Thanks for yours response. Cover orders will be available for currency but without any margin benefit soon. We have consciously decided to not offer cover orders for currency trading with a higher leverage. Currency inherently is a high leverage product, for eg you can trade USDINR with 2% margin, which is around 50 times leverage. If we give any additional leverage, we as brokers would be taking unnecessary risk and hopefully you’d appreciate that we as your brokers rather be safe than sorry. Zubin 2 Weeks, 4 Days, 19 Hours, 22 Minutes ago. Susanta Saren 2 Weeks, 3 Days, 10 Hours, 30 Minutes ago. Hi Zubin, I think you cannot modify the SL value. The only way is to exit and take the profit. Is it possible when market go our side we upgrade s/l in bracket order? Yes Vijay, presently you cannot modify the SL value, you can only exit it when you want to get out of the position you hold . Hi Nithin, has this changed at all in 2013/2014? i.e. Say on a Buy CO, if I’m making a profit, can I increase the Sell SL to above my Avg. Buy Price? e.g. if I buy ITC at market when the price is around ~312.00, the SL for the CO will be something like 309.00 or 308.00. But suppose the price of ITC goes to 316.00, can I change the Sell SL to 315.00 (above my Avg. Buy Price) thereby locking in the Rs. 3 profit? Or is the only way to square-off by manually clicking “Exit” on the SL in the Order Book? For now, you cannot modify the SL even if the stock moves in your direction. So as of now, the only way to square off a position by clicking Exit on SL. In reference to the above example, is the SL range modification available now. If my intraday profit has gone up and I want to trail SL which is outside the system specified range of CO, will I be able to do so now? If I placed Cover order [email protected] with [email protected] & I want to Book profit @ 120 then if my target price gets achived then what happens to [email protected] order. Does it get cancelled automatically? Should I Cancel it or Exit it?? Just click on the pending stoploss in the order book and click on exit. It automatically turns into an exit order. How we will put a target for covered order? buy or sell window for placing the order fast ? The range will be 1.5% or as mentioned by default on the cover order, you cannot change this range. You cannot set this automatically, will have to be placed manually in the range mentioned on the order..
Can MIS order be changed into Cover order ? Once the SL is placed, it cannot be modified. The SL order can be modified, but within the 1.5% range itself. Which of the above 2 sentences in the blog is correct ? No MIS order cannot be changed into cover order.. SL can be modified within the initial range while placing the order, it cannot be modified to a price outside this range..
Can we make the trigger price equal to ATP of the share by default on ZT ? No this would not be possible..
please confirme me when the CO will start enable to trade.More trader know CO is much important for day trading,it make compulsory to keep stop lose and its good rather stop lose on mindkeeping.previousely you mention about margin,here important is not for magin given,here important is “compulsory stop lose for every trade”. CO is enabled for Eq/F&O and for currency trading. For currency trading we don’t provide any extra leverage if you use cover orders as the margin required for currency trading is already very high 3% for USDINR(33 times leverage). Waiting for exchange approvals for the same for commodity trading..
Is there a possibility of One Cancels Other (OCO) orders? One cancels other is presently considered by NSE as an algo(automated trading) and not allowed on retail client terminals.. When you first asked the question, CO for currency was not enabled, but it is enabled today and the changes made in the blog as well..We enabled it only last week.. I double checked it, seems to be working, do try placing it tomorrow morning..
Today again i cannot take CO on currency.My ID-RC0258.Please help me. Can you try this today and let us know, it is enabled to everyone..
1. Cover orders, the entry and exit has to be market orders. 2. Spread orders, which is used to enter calendar spreads where you have a 2 legged order. One order can be limit but the other is always market. You don’t really get an option to choose IOC/DAY. I try today again it is not enable,here i got an error message”RMS blocked for cde_fo CO BLOCK TYPE: ALL”Please help me my id:RC0258. or do I not have the option for day. Vijay there is nothing called a multi leg order, there is a spread order window where you can trade calendar spreads(buy & sell different expiry of the same contract). If you want to trade 2 different contracts at one time, you can use basket order option and you can choose the order type anyway you want. http://www.zerodha.com/z-connect/blog/view/basket-orders-zt to see how to place basket orders. A lot of people whom i know stay with other platforms as we at zerodha dont have just 1 feature…. Why don’t we have oco orders like upstocks or bracket orders like Sharekhan. We have cover orders where the trade gets executed at market rates and we also have bracket orders where we can’t place stopped and target at the same time, when 1 gets executed other gets cancelled. Basically to summarize i need an order type which gets executed only at my given price like sl in bracket order, also in the same order I can also mention my SL and target. Example I want to buy Stock A @ 5 Rs when cmp is 4.5 my buy action triggers only when price reach 5rs. Also I can place my profit at 1rs and sl at .25 Rs in the same window… please try to provide this facility in kite. Hardik, there is no difference whatsoever between an OCO and BO. Check it out! Check this post, explains everything about placing a SL. please suggest me how to solve my problem on CO for currency. I think it is solved, we have tested it again after market closing. Give it a try during market hours today.. I tried the cover order the other day, but it did not allow me to trail my stop loss when the position was in my favor. Is this facility not available. Please note that this is a useful feature for intraday traders. Pallavi, In cover orders, you cannot modify the stop loss beyond the range that would be shown while placing the order. This is how the product is approved by the exchanges and we have to work with the same rules. Has this been changed? Automatic trailing will be ideal but we should at least be able to manually change the trigger price in the pending CO-SL order when the prices moves our way. Cover Order is enable for Commodity?? If yes, How much leverage i will get on Gold??? Cover order can be placed AMO’s?? Cover order is very good tool. What about Spread orders?? how do i place an order by using Spread?? ?Please let me which are the exchanges we can do trade in spread orders i.e like NSE, NFO….?? Okay Thank you sir. One more thing the Spread order can be do like Buy/Sell Options for different expiry?? The spread order is mainly for calendar spreads( buy/sell different expiries of the same contract). We will put up a blog on how to use the spread order window next week, but if you want to place multiple orders at one time check out [Basket Orders](https://www.zerodha.com/z-connect/blog/view/basket-orders-zt). I am a NSE Future day trader. You have introduced the CO similar to Bracket order (but Without target price). Thanks & congratulation for this. After reading all above posts, I understood below things about Cover Order. Please correct me if I am wrong. 1)Cover order is executed with Market price only & Stoploss should be set at given price range. 3)CO cannot be used as a trailing Stoploss. 4)We can square off the position by using modify or Exit but it will be executed with Market price only. No need to place separate Limit order for Square off or for profit booking. 5)Entry and exit both are at market price only. 6)CO is only for Intraday. If we have not closed the position before 3.20pm. Position will be automatically square-off by Zerodha at MARKET LTP. 7)CO order is neither MIS order nor a NRML order. 9)We can’t convert CO to normal order. We have to exit from CO if we want this change. 10)Please explain how can I place a Stoploss (which can be trailed) & profit target orders? Explain with example. 11)What is the meaning of MIS & NRML? 12)Can I carry MIS order or it is also made for Intraday? Awaiting for your quick & positive reply… Also waiting for the start of “Bracket Order” facility for F&O. You are absolutely correct upto point 9. We shall start working on the videos soon..
Sir, To trade with tata steel SL [email protected] and [email protected] together in the basket order how much amount is needed? Once you buy a stock, there is no extra margin charged for placing a stop loss and an exit order..
How much margin depends on the product type and segment you are trading in..
For equity: If using CNC(Delivery): 100% margin, if MIS(intraday equity): 10%, if Cover orders: 6%..
For futures/writing options: If NRML: 100% of NSE stipulated(for tata steel around 54k/lot), MIS: 40% of NSE stipulated and 25% of NSE stipulated for cover orders.. Thank you for starting of this order type. It helpes to maintain a discipline of STOPLOSS & always trade safe. I wanted to request you to please provide a facility of placing profit target order in CO. Also buy/sell order with limit. It will help us to increase the possibilities of winning trades. If you want to reduce the leavrage then it is also ok but above requirement is necessary. As this order placed at Market price, we can’t place order as per our requirement example If stock is trading at 100.50 & I wanted to place my order at same price then it executes at different price like 99 or 111. I need to tackle this issue as early as possible. The cover order is given higher leverage because of the rules that come along with it. It is approved by the exchange this way and unfortunately can’t be changed. Also please remove unwanted/unnecessary comments from this post which are creats confusion. Can you please explain me about MIS order? 2) For placing this order we can use only F1 & F2. 3) If I have bought any Stock/Future then I need to place 2nd order for SELL. 4) I can place stoploss order with initial BUY/SELL order. And Stoploss can be modified after execution of initial BUY/SELL order. 5) I can trail my stoploss by modifing it. Is there any explanation about MIS order just like above CO order? If yes then Please send me the link. Yes Sandip you are correct. the only difference between NRML and MIS is that with MIS you get extra leverage and hence has to be squared off by 3.20pm..
Hi, can I place cover order in any stock? For many of the stocks, the trigger price range is shown as 0.00-0.00. What does that mean? You can place cover orders on stock which we let you trade intraday on, the other stocks you cannot use this feature and hence might show the trigger price range as you have mentioned. [Click here](http://www.zerodha.com/z-connect/blog/view/zerodha-margin-policies) to see where the intraday excel margin file can be downloaded from..
That mean I can use CO only for the stocks mentioned in the intraday excel margin file. Is that correct? I am facing issue with order placement. Please answer to my below query. (1) I have placed a ‘BUY’ order with “SL-M” using “MIS” option. LTP = 100 & Trigger Price(SL) = 98. My order is execuated with LTP as it was a ‘SL-M’ order. Now I want to modify my stoploss (Trigger Price) to 100 as stock moves to 104. But I am not able to modify it. I have asked same query earlier also & you have told that it is possible to do it. Please explain. (2) After buying this stock @100 Now I want to sell it. After showing above error I used ‘SELL’ order with ‘SL’ type. Price (Target Limit)= 106 & Trigger Price= 104 but again it shows error that “Trigger Price should be greater that Price.” So I have done vice a versa that is Price (Target Limit)= 104 & Trigger Price = 106. But it Execuated at LTP i.e. 105. I request you to please explain it in detail. I have checked all blogs about Orders but all presentations are not sufficient to understand. Can you please make graphical video or slide show same as ‘Interactive Broker’ or Sherkhan. Request you to please do it urgently. Sandip, if you are having trouble shoot your query to [email protected], will get someone to call you back and run you through this. But let me run through whatever little I have understood. 1. Enter a position: Stock is trading at 100, you can buy this either using limit order, market order or SL order. 2. Place a new selling SL order with trigger price that you wish. 3. Place a limit sell order with target price. To change order 2 and 3, go to order book(f3). When you enter position using SL order, once the stock is bought/sold, you have to place another new SL order for stop loss. The first SL that you used to enter a position is already executed and hence there is no way you can modify. The second SL order that you put can be modified by using the trigger..
wel i do understand cover orders now..
but wat i dont get it is that why cant the trigger pending orders be cancelled ? but the fact that u can exit the orders only by using the same quantity entered is somewhat tiresome..
for example .. i shorted 300 shares of stock A @ 150 and now i can see there is only upward trend, but they are fluctuating.. so in order to reduce the loss i wanna sell the shares in small quantity like 5 & 10 so that i can enter other stock B . this i could do very well in MIS but in CO i jst cannot..i have to exit only these 300 shares at once.. because if i use the CO for buy stock A then that order also has the sl trigger pending and shuld be exited independently..
can there be a method that once the position of a stock settled (ie buy and selling is done) i can re-enter it and it doesnt affect my previous profit ?? Cover orders as a product has rules which are fixed and nothing much can be changed about it. As far your other 2 queries!! 1st trade you bought 300 @150 and sold at 160, you made profit of Rs3000 . 2nd trade in afternoon you bought 300 @150 and sold at 150, 0 profit, total profit for the day is Rs 3000..
What you need to understand is that admin position will show you the average buying/selling price and has nothing to do with your profits, your profits will remain the same. As an average it will show that 600 shares bought at 150 and 600 shares sold at 155( avg of 150 and 160), profit is still Rs 3000..
so avg profit is 160-154=6*400= 2,400 !! so ill get 3200 in account or 2400 ?? so the cover orders… no changes in near future ? 🙂 , Markets give you new learning experience everyday..
Cover orders is kind of fixed as a product, so no changes.. I do not want any extra leverage or margin than what is available in my account. Is there any way I can place an market buy order which squares of at a pre-specified gain or loss percentage. For example, assuming that the market buy order gets executed for a premium of 10000, I want to exit when it attains a specific value. Say, I want to exit when it reaches 10,500 (500 profit) or 9000 (1000 loss). If you are buying stock without any levearge, use the product type as CNC while placing the order. But for doing this you need to have demat account with us as well. Once you have bought the stock at 10000, you can put a CNC selling order at 10500 and CNC SL order at 9000. You will have to place this [order](http://www.zerodha.com/z-connect/blog/view/orders-place-modify-cancel-view) everyday though as exchanges will cancel all orders at the end of the day. You can also place the orders using After market order the previous evening if you don’t have access to the markets during the market hours. S.sivakumar 2 Months, 1 Week, 17 Hours, 36 Minutes ago. There were 217 scrips available for margin trading before. But now your new margin scrips list with cover order shows only 156. For example Jet airways is excluded in your new list but unknowingly I made a cover order on 05 Jan 2013 and that order got executed. Do you give any leverage still for those excluded scrips for the cover orders? Zerodha reply 2 Months, 5 Days, 14 Hours, 11 Minutes ago. S.Sivakumar reply 5 Seconds ago. However, I was not able to Trail my SL beyond cost price. I bought BNF at 11308, with SL of 11250. So far so good. Now price started moving in my direction, and is trading in the range on 11380. I want to modify my SL to 11340 ( to cover my cost). However, I got error, that SL can not be above cost price. However, I was able to place SL at 11307. By placing SL at 11340, I am indeed reducing risk, and I think it should be allowed. Point noted and we are already on work. Cover orders has been approved by exchange in the version it exists presently. The modification of trigger should be available soon on cover orders..
when will co order comes for commodity…??? 1) Shorting/Writing a put implies selling the put first and then buying it back later.. To sell you will have to use F2 to open the sell order window. 3) If you choose to square it off, you will have to place a buy order for the same option you have shorted or you can square it off at the market price from F11 (Admin position window) by selecting the position and clicking on Square off button present at the bottom right corner. Check out the image below… All you have to do is open Trade Xpress and when you place an order select CO in the dropdown of Prod Type. All futures available on NSE is enabled for cover orders. MCX still not enabled for cover orders. is 25% of 25000 6750? or 6250! I have read this blog extensively and found CO to be of great importance in enhancing ones profit with the same capital. While reading the blog I got the sense that many traders would like to have limit order for exiting / squaring off CO. Can we have this feature added and if not what is the logic / problem ….. In Cover order you would already have a pending stop loss order and since the leverage is higher, you are allowed to just modify the pending SL order as a market order. If we allow you to modify this pending SL as limit order, then on the downside the protection is removed. Hence we don’t provide. Yes that won’t be possible, you will have to exit it as a market order..
Can we incorporate a feature which can allow us to put such limit order(as discussed above) through modification option via trade book. I mean to say that we have the system generated pending stop loss and at the same time the pending limit order(above the stop loss) whichever hits first. This in no case will effect the safety which the stop loss provides to give higher leverage through CO and we will have the set target as well. I understand this might require some software modification but this would be an asset for small traders who follow the standard rule of having stop loss as well as set target for the trade. Please let me know if I am asking too much. Please, can you answer my above query …. This is not possible presently and have forwarded to our technology team to figure out if this is feasible. Will reply back to you on this. Thanks a lot… Please let me hear from you as soon as you get a reply from your tech team. In anticipation of a positive reply. SL/SL-M and cover orders are not the same. In a cover order you are buying at market price and putting SL-M at the same time. You are enforced to put the SL-M and hence the margin requirement drops. When you have bought/sold, you can manually put SL/SL-M using F1/F2 window to stop loss. Is cover order margin available for short selling of equities? You can use cover orders for both long and short selling equities, but only on an intraday basis. You will get leverage upto 20 times if you are doing so. Can you assist on cover order. For example a stock trading at 100. When I select a cover order to BUY. The trigger price range shown is 100 – 95 with PRICE TYPE – MARKET. I place trigger order price as 105. Am I right the stock will be bought at current market price and a sell order automatically goes for 105? The trigger has to be placed in the range of 95-100 to ensure that if there is a loss happening your stop loss is hit. This trigger has to be in the same range shown there. So you can place a trigger at 95. So if it makes a loss, it will get squared off at 95. If it goes up, you cannot place a limit order at 105, you have to as mentioned in the blog click on the pending stop loss at 95 and click exit to square off at market price..
After target gets hit I cancel the SL and if SL gets executed I cancel my Target. Can my previous requirement be solved through cover order then how? Like putting selling target at +1 present of buying order and putting SL at -.5 present of buying order. Can the value target and SL be modified in between order execution? What you are asking for is a bracket order, where you can place both SL and exit order. If one gets executed, the other gets cancelled and both can be modified at anytime. This is presently not available as bracket orders are considered as algos by the exchange. In Cover order as mentioned above, you buy it at market and you have a preset SL in a range mentioned while placing cover order. Once this is done, you have to modify the pending SL by clicking exit which will sell again at market price. This would not suffice your requirement. CO will give you leverage of 20 times though. Can you please confirm if Cover order is available for commodity Trading on MCX? If yes what are the margin requirements with cover order as compared to MIS order. If Not then when it will be made available for commodity trading. It is still not available for commodities, we are waiting for exchange approvals on this. Thanks for quick confirmation, do you have any timelines as to when you are expecting exchange approval and potential activation date for commodities? Exchange approvals in India are among the hardest things to get. It’s a highly regulated industry and it takes its own time. We’ll keep you updated on whenever it happens. Is the margin for F&O under cover order is the same what is given to equities. Where can see F&O margin for cover order. Check the SPAN margin file on the Backoffice, you will need 25% of total margin on that, click on this link to know how to check this file. My Target Prize is 930…and Stock Going Upword…. SO as soon as reach 930 i exit from the stock using orderbook pending sl order…. if i want to set limit for the target prize which is 930 ….which is the best way to trade…..? Firstly MIS and CO are 2 different order types, with MIS on reliance you get 10 times margin whereas with Cover order you get 20 times. If you are using cover orders, the only way to exit is by modifying the SL to a market order. So basically when reliance goes to 930, you will have to click on SL and also on exit, this will sell reliance at market price. When you sell at market price, you may not exactly get 930, it could be a little lower or higher. Since Reliance is a very liquid stock, you shouldn’t have too much trouble exiting it as market order. If you are trading using MIS you can put a SL and target order manually and as a limit order. So when reliance goes to 930, your order will be sold exactly at 930. But you will then have to cancel the stop loss order manually. in cover order as there is stop loss entry . there should be a profit target entry also. After i buy some lots using CO, can i place target order like using F2 in normal orders ? No you cannot Vicky, The only way to exit a cover order is to go to order book and exiting the SL order pending in your order book. You cannot put a limit order to exit. second nest plus is paid advisery…nd ambi broker means what? how to use it? Hi, we’ve just enabled your Cover Order facility. To use CO, just press Shift + F1 on your terminal ZT. Or you can right click on the scrip and choose Cover Order from the menu. On the web terminal, you should now be able to see CO apart from MIS and NRML. Nest Plus basic charting is free. If you want to use advisory on Nest Plus, you can use any of the available ones, but please note that most of them are paid. You will get this information whenever you subscribe. If you do subscribe, you have to pay directly to them using your credit card. AmiBroker is for automatic and semi-automatic trading. Since this is a completely online tool, you’ll have to go to the Global Datafeeds’ website and use their online support to get it installed and use. More information is available on this blog. biggest issue I found with cover order. When the price went to 304 I wanted to modify my stop loss to 309 but it did not allow saying stop loss should be above buy price. Though LTP is quoting @ 304 so when trade goes in your favour still you cannot lock in profit. There is no other option than to quit position. thanks will be waiting for an update once implemented. Can we square off Cover Oreder from Admin Panel’s squre off button? If not please eanble this feature ASAP. No, this would have to be done through the order book only and not possible from admin positions. We are waiting for exchange approvals on this. When I buy a cover order, the stop loss is fixed at 5.35% and not 1.5% as written in the article. Whenever I buy a cover order for a stock whose price is increasing very quickly, the trigger range changes and a window pops out telling I cant buy the stock as the trigger price is not within the trigger range and then I have to change that trigger price. Now what happens is that by that time the stock further rises. My question is how do I immediately buy a cover order for a stock whose price is increasing rapidly? If the answer is that it is not possible then at least zerodha can make that 5.35% editable by the user, so that the user can keep that at 4.35% always and then the window would not pop out. Also when a person clicks to buy a cover order, then he should be able to keep several windows open for buying different cover orders. However the thing is that only one window opens up and if the person clicks to buy another cover order then the first window gets replaced. thanks for the feedback, let me bounce this off our tech team and see what can be done. First of all thanks ZERODHA for the awesome forum. My question is what is the difference between Tr.Price 0 and Triger Price Range. Ex. I want to buy 1share of XYZ at Rs 100. And i want to sell if the prices goes down to 99. So in this case what i need to mention in Trigger Price Range, Tr. Price0 and Perc Max box. In the cover order window, you will have only 1 place to fill which is the trigger price. 1. Buying 1 share XYZ by default is market order and in cover order you can’t place a limit order. 2. While buying at market, the order will suggest you to place a trigger in the range of 97 to 100, and you can place any trigger, in your case this would be 99.
say suppose I want to buy 2 lots(100 units) of NIFTY 6000 CALL Option at Rs.153. What is the min. amount I should have in my account for Intra day and delivery? For buying options you don’t get any leverage even if you use cover orders. If you want to buy 1 lot of nifty at 100 ,you will need the entire Rs 5000 in your account( 50 x 100). Great product,, CO i use it often,, but trailing stop loss as percentage or points would be greatly appreciated and helpful,,in raking in more profits..
1. I cannot place CO order through mobile trading app (Nest Mobile trading). 2. I also cannot square off CO order which are placed through other channels (Zerodha trader or Trade Express). 3. Kindly show me the exact way how to square off CO order through Mobile trading App.? Sheetal, it’s nice to know you use our Cover Order facility as it was created for day traders to trade with low margins and high frequency. 1. CO is not yet available on Zerodha Mobile as we’re still waiting exchange approvals for this. It should be available for use on mobiles very soon. 2. You can’t square off CO on mobile because it hasn’t been developed for it…yet. 3. Since you cannot square off CO through the mobile app, you can just call our call center and our executives will square it off (exit the position) for you at no additional cost. 4. It’s true that the mobile trading app can be improved and we’re already working on an improved version. The reason the app is not available on the Play Store is because it’s a very niche app and doesn’t have too many users yet. Any reason, not to include CO as part of AMO? can we have CO as part of basket order? It will be helpful, if this option is available, to place CO for many stocks on market open based on trend. Presently this cannot be done, but will bounce this off our tech team to see if it can be made possible. if i enter my positions @ 344 what exactly my sl? Chinta, it shows a range, but in that price you will have to mention your stop loss price within that range.. The price is determined by you. Write that number 350 in the box which says trigger price range..
1. I placed a Buy Cover Order with a SL. The Buy is executed and then the price is still going up. At a certain point I decide to Sell, so I go to Order Book and click on SL and click on exit, this sells the stock at Market Price, so that is fine. Can I place a simultaneous Sell Cover Order with a SL right after (say after 2 -3 secs) placing the above Buy Cover Order with a SL? 2. If I place a Sell CO and a Short Sell is executed then if neither it goes further down and neither hits my Trigger price of the SL, then what happens at 3:20PM ? Yes you can place a simultaneous sell cover order with a SL, but 2 things you need to note is that a. Cover orders only allow market orders b. if this is sold it will be like creating a fresh position, it would not be equal to exiting the position you already created. 2. At 3.20pm, the pending SL in order book is modified to market automatically and position squared off at market price around 3.20pm. I did not find a correct header under which this question can be put so I am putting it here, kindly clarify this doubt. The Bid/Ask rate shown on NEST Trader are substantially higher than the rate shown on NSE 1 min chart. Why is this difference and would this not lead one to buy at incorrect/higher prices ? Also, one cannot plan and pre-calculate strategies also because of this discrepancy. Also, HIGH and LOW values shown on nest trader are 6268.70 and 6239.0 where the HIGH till 10:04 AM (Nov 7th 2013) is 6232.15 and Low is 6207.35. Is there a problem in the system or my understanding ? Kindly clarify . Also,my charting software is not working (Plus) whom do I need to contact to rectify? The chart and prices(the bid/ask) that you are looking at on NEST is for Nifty futures and what you are seeing on NSE is for Nifty spot chart. They will definitely not be the same, you cannot trade the nifty spot, whereas you can trade nifty futures. Check this blog for help on charting, you can also send an email to [email protected], someone will call back and explain you the same. Nifty future is a leveraged product, so what this means is to buy the entire value of contract you need only a small margin. Check this link for margin for various contracts. You need only 25k to buy a contract worth around 3lks and once bought you can keep it till the last day of expiry. I’d suggest you to read up on how futures work before taking trades. The software will show you only previous day close and not previous day high and low. If you want to see previous day high and low you need to look at daily chart. This link has blogs on how to initiate charts. This is a question about placing a buying Cover Order. If I place a Buy CO, I will get at the market rate I understand that, but what rate would that be? The LTP, the current Ask Rate or the highest Ask rate (which we can see by double clicking on the Future and a pop-up window comes up (Snap Quote Dialog) and the highest value in RED font) will I get at that rate? kindly clarify ? If you place a market buy, you will get the best offer/ask rate at that time. But note that from when you place a buy to when the order gets executed, the best offer could or actually would have changed to what you originally saw. In cover order if i am buying a stock @100 and say my stop loss is @ 98 and the market moves upwards i want to take the profit @105. 1. How to take the profit @105. 2. When the LTP is @103 is it possible to move my stop loss to 101. 1. To book profit, you simply have to go to F3 and click on EXIT. 2. Your stop loss cannot be higher than your entry price. If you have bought at 100, you can place a SL only below it. You cannot trail your profit in a CO. The basic idea behind a CO is for quick entries and exits. Thanks for your Reply. I want to open an account with zerodha. I have just completed my studies. What are the requirements to open an account.I want to trade both commodity and equity.Please let me know. To open an account, you need a PAN, Bank account, Address proof, send your details to [email protected], we will get someone to call you back. Suppose if I want to Sell a share which is trading @ 600 Rs and i want to exit the trade automatically once the price hits 605(Loss) to restrict the loss and 590 (profit) to book pofit . How to do this in MIS product and cover order. Not possible in cover order, you can do this on MIS. Check this blog on how to place stop loss orders. 1. enter into the position, so you either sell limit or market when the stock [email protected] 600. 2. Place a limit buying order at 590 for booking profits. 3. Place a buying SL order with trigger price at 605 for stopping loss. The only thing you need to make sure is that you have to manually cancel one if either the target or stop loss order gets executed. In CO, you cannot place a target order as explained in the blog above, you have to modify the SL to exit positions. I am not able to use cover order to sell in the NFO segment. I get the following . Please look at the screen shot and let me know whether i have made a mistake or there is some other error. I am a MAC OS user. Therefore I am trading using Z5. Where as the trigger price range is 156.50 – 132.20 . Here the trigger price should be higher than the sell price. Where as in the system it does not allow any number. Kindly help. We are getting someone to call you on this. The aforementioned problem is there in Z5 and the same is not related to the operating system one is using. I’m using Vista and 7 and facing the problem while trying to short sell in cash segment. Also, while trying to exit a CO from PC app have noticed that the system at times rejects the exit order saying “trigger not met”. Only when you continuously select the exit button (in panic) that it does the needful. Yes Bala, there is an issue with cover order on both Z5 and the mobile app. We are speaking to our technology vendors, to have this fixed soon. You’re doing a great job…. As pointed out by many above, when will you fix the bug that doesn’t let traders to increase the SL to lock-in some profit? A CO should also give the opportunity to protect profits…..
About 3 months back you wrote that this will be fixed soon but am afraid it’s not done yet. Wonder why this this thing is taking so much time. Neither the Z5 trouble nor the SL thing has been corrected yet. Without the flexibility to increase the SL to lock-in profits, this whole feature of cover order is a little less than useful. Bala, we’ve discussed this with our developers and they have assured us that they’d look into it, but things don’t happen that quickly for a couple of reasons. Firstly, the developer and the broker has to demonstrate the modified version of the cover order to the exchange. Secondly and more importantly, the idea behind a cover order is quick entries and exits at market price. What you’re asking for is something like a bracket order or a trailing stop loss. Even that is being discussed and we hope to have more options for you very soon. I get your point but here we’re talking not so much about modification as rectification. The Z5 problem- you can’t enter into sell orders. The same problem is not there in Zerodha Trader PC app. i just wanted to know whether your website has any similarities with the many other trading platform websites in the world which actually give live feed calculator of the top hundred organizations,companies,industries,currency….lot many whether its definitely gonna have a raise of a hit ratio of atleast 90%(am just talking trading,coz i do not know any other). Yes we provide 3 versions of trading platform, a web, mobile and a desktop, you get live feeds of all stocks and derivatives on NSE, BSE, MCX-SX, MCX. Is this cover order facility will be available for mobile traders also ? Presently it is not available, but will be given soon. One more doubt if we are taking cover order e.g X stock future @ 10 and selling X stock call option 12.5 @ Rs 1.5 ..So at the end of the month the stock moved to Rs.14..In that case do i need to add the MTM on daily basis or it will be compensated(because my future script gaining but option in loss) ..what would be the solution for this scenario ? Karthikeyan, what you are referring to is not a cover order. It is just a hedged position. As stock keeps moving up, your short calls loose you money, but long futures make you money on a MTM basis. In this particular example, you will not be required to add any MTM for your option loss as the risk of your short option is completely hedged by long futures. Then probably my next question would be “will i get the margin benefit for hedging position ? ” because it is showing in SPAN calculator ..If so should i have to place both the order at the same time and exit at the same time ? Is it allowed to place two orders in opposite directions of CO and MIS as in Buy NIFTY Futures CO and Sell NIFTY FUTURES in MIS? Is it possible simultaneously? Is it possible to place MIS in opposite direction as Sell when already a CO is open as Buy in the same Future? This is the best strategy for CO trading, is it possible? Yes, if your target order gets executed the SL order gets canceled, and if your SL order gets executed your target order gets canceled. No, this is not available for MCX just yet. Yes, we’re aware of this and are working on having this resolved at the earliest. In the meantime, you can use Zerodha Trader or the regular TradeXpress window to place your cover orders without any hassle. sir, please let me know if i can take both sides position short and long , same stock,same time,same price using cover orders.as i think both the orders will be treated separate orders. Any answers for this question??? Has been asked several times already. Well, that’s a tough one. A lot of indicators have their own plus and minus points. Our advice for you is to use a combination of indicators so that you have a higher probability of winning. It’s always best to pick your own preferred indicators based on your time frame and the current market sentiment. It’s also very helpful to backtest your indicators and ascertain their performance before betting on them. I am a beginner in trading…a few days back..i bought and sold apollo tyre(i put amo) at approx 106.4 and 106.7 quantity:2500 ,intraday with prod.code MIS, i had an accnt bal of approx 52k…it got executed…and a day aftr tat…i again bought nd sold apollotyre(amo again) at approx 110.4 and 110.7, quantity:2500,intraday,MIS. but this time both buy and sell orders gt rejected with the reason ….that required margin is 91k, but available bal s oly 52k…. i cant find myself a proper explanation for this.. :/ zerodha can u please help? Apollo tyre is presently in ban period set by NSE, that means no new positions can be entered into. Check our Margin calculator for futures on this link, the contracts which are in ban period is marked in red..You can start trading on it, as soon as NSE removes it from BAN period. What you have asked will not be possible on CO, if you buy 4 lots using CO when you are exiting, you have to exit them together and can’t be done partially..
i have a query rather important to me, and have already posted it in ‘Position conversion’ topic. Suppose I have 3 lakhs worth of stock in my demat and no ready cash. 1. Will I be able to take an intraday position for the day with the delivery stock as a collateral? 2. If yes, then will the intraday have to be MIS or can it even be CO? will I be able to take a 1x intraday position in 3 stocks with delivered stock as collateral? If you pledge 3lks of stock, based on the haircut, collateral margin is added to your trading account. Assume the haircut is 20%, so out of the 3lks stock given 2.4lks is credited to your trading account. You can use these funds to trade futures and options only, and not stocks. You can use MIS, CO, or NRML, it is upto you, no restrictions on that. Is there any reason why I cannot trade stocks with this collateral margin? I am new to this so if could throw some light on this, it would be helpful. If I buy 2 lot ( 100 Qty.) of Nifty Future @ 6300 and my stop loss is 6250 using cover order. Now I want to sell one lot (50 qty.) at @6325 and another lot at @6340. Is it possible to execute automatically by booking two MIS sell limit orders @6325 and @6340 respectively? Please also tell me if there is any other method to do the same. If you have entered this trade of 2 lots using product type as CO, you cannot exit individually, you will have to exit both together, and that too as mentioned in the blog above, by clicking on exit, which means it will sell at market price only. If you have bought the 2 lots using product type as MIS, yes then you can place 2 different sell limit orders, one at 6325 and another at 6340. Nitin sir how many “canara bank” futures (intraday) can be buy with 50,000 in account. Also tell if i place order at 2:00pm , at what time it will automatically square off…??? Do you treat a SpanOrder or BasketOrder as one order for charging brokerage or as different orders. Eg. I want to execute a Short Strangle as a Span Order by Shorting a Put and a Call. Do you consider this as one order or two orders? Similarly a butterfly. Please clarify. Thanks. It will be considered as two separate orders since the orders though they are sent as one using a basket, but is accepted by the exchange separately. cover order is blocked for options, i would request you to activate cover order for options, no need of extra margin….just like how you give 100 points stop loss range for nifty future, give 20 percent stop loss maximum for options. On an expiry day where huge volumes take place in options, and many strike prices go zero at 3.30pm, if there is cover order, we can safely put the order with a maximum stop loss at 20 percent. But many times i don’t trade in option on expiry day, due to fear that by the time i put the stop loss order, out of the money option becomes zero in just 45 seconds. So it will be very useful for protecting your capital, and days like RBI policy day, budget day, were is split second a big move happens, and you dont get enough time to put the stop loss order during those days. Quick question, did the leverage for Cover Order just change today without any notification? Till last week it was twice of the MIS multiplier, today it’s showing LESS than the MIS multiplier on the Equity margins page. Fpr Example: RELCAPITAL CNC: 1x, MIS: 9x, CO: 5.55x … how and why was this changed suddenly? Now the CO Multiplier is showing 0x for all stocks on the Equity margins page (https://zerodha.com/margin-calculator/Equity/) … something is wrong with the page. Understood, a heads-up would have been nice. I got spooked when saw it in the morning, I use this tool very extensively for calculating margin for each of my trades. Thanks anyways. Hi Nithin, saw the new page for the BO/CO margin calculator. Is it possible to change the output a bit or may be as an additional functionality? Being more used to trading with full margin available, it would be nice if it told us how many shares of a stock can I buy with available cash (like it used to do on the older CNC/MIS/CO) page. It would be otherwise pretty cumbersome to find out by trial and error. Thanks! Got it, we will get this done. I can not trade in equity. In z5 there is only two option showing nsfo&cdo . what to do to enable equity ? Cover Orders are new-age products and hence won’t work with the basic version of the web login. They work only on Z5 and TradeXpress. Also you get the message “CO cannot be modified” because cover orders can be modified only below your entry buy price. You cannot trail your profits in cover orders, you can do this using Bracket Orders. I guess the only problem with CO is, we cant able to trail our SL while the market moves on our side. Although the trigger price range dynamically shows some range to current market price. But the SL could be placed only till our entry buy/sell price so there is no protection and we cant even break even our positions. If this issue is fixed, that is if we are allowed to trail our SL range until current market price like it actually shows in trigger price range, we can make our position protected. I think the answer for this is BO but I heard there are some software bugs with BO. I m quite comfortable with CO I have no other requests like partial order execution, making this small change will actually make CO a more useful tool, I think this is the long term request from users since CO is introduced. I hope zerodha will consider my request. There is a Link there called BO/CO, click here to check it out. Modifying stop to lock profit available in CO as in MIS order now? It was like that a while back, but now you can modify the SL when stock moves in your direction. Cover orders are market orders. Can algo Z be used to trigger cover orders at a particular price point. Say for example, nifty is at 7870 and i want a short cover order to be triggered when nifty reaches 7900 with a SL at 7920.
a) I don’t find cover order option on my mobile (or maybe I’m missing something here), could you please explain me how do I do the same? b) To square off a cover order does is use the same procedures or is there something different? 1. You cannot place cover orders on the mobile platform just yet. You can only place MIS and NRML orders on F&O. You can place MIS and CNC on EQ. 2. You can square off cover orders only on Z5, TradeXpress, or ZT by going to open orders and using he Exit option. You cannot exit cover orders on mobile. Is CO available for Commodities? I’m not finding MCX option in BO&CO Calculator! Yes it is available now, we haven’t announced it as yet. The calculator will be updated shortly for MCX as well. Cover order always should be placed with Current Market price? Please confirm,, Thank you SO much for your patience. Yes Manohar, the entry is using market price only. Is there a plan to enable CO (and BO) for Z5 and Zerodha mobile anytime soon? Would be a great value-add for all those who can/ do-not use ZT very frequently! Will take a bit for this. Is there any chance to add multiple stock futures orders in single cover order window..
like placing cover order for both nifty and bank nifty..
M a great fan of Cover Order. But what happened with me today really jolted my confidence. Today(24/06/2014) I placed Buy Cover Ordr for IDBI14JUNFUT & set my SL trgr price @ Rs105. My order got executed @ Rs106.40 at 9:21:30 am & accordingly pending SL was set @ Rs105. My SL got executed at 9:58:10 am when in fact IDBI14JUNFUT Ask Price was @ Rs105.20. Irony was that, after my entry IDBI14JUNFUT never came down to Rs105 throughout the rest of the market day & in fact it closed around @ Rs107.25. IDBI14JUNFUT did came down to the level of Rs105.10 as a low after my entry but that too was at much later time, which was around 10:05:00am (after my SL got executed @ Rs105). Moreover, the chart (I follow 5 mnts Candle) does not show my executed SL of Rs105, rather the lowest price for the rest of the remaining day is Rs105.10. As per my understanding, pending SL trigr price should exist at your system only & it gets placed with the exchange only when the market price reaches SL trigr level. How did then it got executed without the market price reaching SL trigr price level? After that early morning first trade disaster I could not gather the guts to touch the market for the rest of the day, even though the market today has shown a very healthy sign right from the beginning. I have totally lost my confidence level. Now I really don’t feel safe as to should I be placing CO, BO & even SL Order. Kindly look into the matter & help me understand it. If it is a bug problem or a system snag kindly do the necessary action. (I have snapshots of Trade Book, Chart of the day & Massage Log if you need them for your reference. Just let me know to which mail ID should I be sending them to). JGB, this is a very common query we get, on why the trigger got hit even though I didn’t see the price on my marketwatch or my chart. Click here to read the explanation. No, there are no charges for converting from MIS to NRML, no actual trade takes place while converting, only the margin blocked for your position changes. I appreciate the trader specific product such as bracket orders develop by your company. I am a option trader and would like to associate with you by opening a trading and Demat account. Buy at 54.60-55.00 and at the same time place target (60) and stoploss(52.5) or only stoploss if my order is executed. Shobhit presently you can enter bracket orders using a limit or a market price, what you are asking for is to be able to buy above the market price(using SL option). This is presently not possible and hopefully will be available soon. Well, it’s very easy to do this. 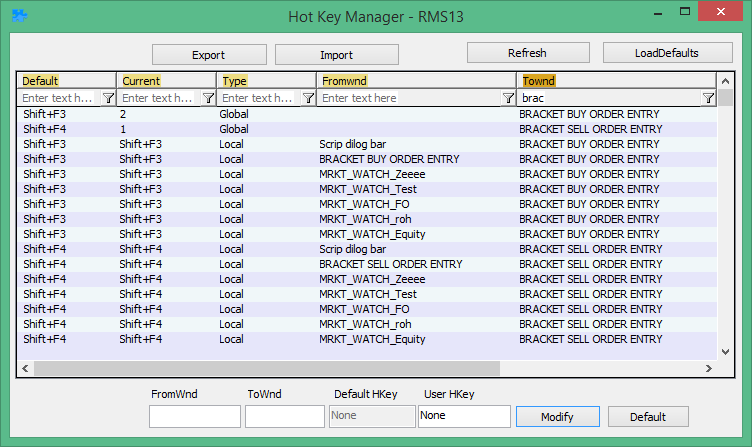 First, open the Hotkey Manager window by pressing Alt+H. Once the window is open, scroll to search cover orders, or simply press Ctrl+F on the hotkey window. Once you have the search function active, search on the “Townd” column for Cover. Check out the screen shot below. Once you’ve selected the row, double click it to make it editable. When can we get the option to trade in BO using SL option also?? Will probably take a bit, we haven’t gotten exchange approvals yet. When can we expect CO on Zerodha mobile platform? Please get us this facility as early as possible…. It might take a bit for this Shiva. Please Suggest how to exit cover order. You can’t place a target price for cover orders, you can only exit at market price. Whenever you want to exit, click on the pending open SL order and click exit, this will square off your positions. If you want to place a target, try the Bracket orders. One marketwatch can have upto 55 scrips, but you can have multiple marketwatch. What is difference between CO & BO order? I think BO order is more advance than CO order, then why should we use for CO order! In BO you have a mandatory SL and target, whereas in CO a mandatory SL only. Yeah, you could use BO instead of CO.
co- cover order.. but BO? bracket order or Basket order? if it os bracket order , is it available in zerodha? Bracket order, yes available, check this post. Start is 9.15am when market opens to 3.20pm. Cover Orders seems really cool, huge leverage. 1. I see the option CO in web platform, alongside MIS and CNC. So when I place the order should I mention only the trigger price and quantity and submit with CO as product type. 2.What should I choose under LIMIT, MARKET, SL-L and SL-M, I guess it should be MARKET. 3. Will the trigger price act as my SL-M order for selling off the shares I bought? 4. Until this I am somewhat clear, But when I use the order window in web platform, I understand one Buy order will be there, which is my entry order and One Sell order will be there with trigger, which is my stop loss market order to sell those shares in case of price moving againt me. What should I do if I want to sell those shares if price moves in favorable direction. I know I should choose the SL-M sell order in my order book, after that I am not clear what to do. Particularly in web platform where will get the Exit option as like desktop software. I think is should use Modify to change the trigger value, but in case i want to square off the shares without modifying SL-M, is there any option? 4. If price moves in your direction, you need to modify the pending SL order to market price( you can either modify or use the exit button on the order book). Ahh.. will check and let you know where the exit button is on the web version. I want to change the Stop Loss value but within the specified range shown during the entry order. It the web platform is not allowing me. Instead I had to forcefully exit the cover order using EXIT COVER ORDER option. If modification is allowed, I could wait few more minutes to see whether I could catch up with the market. SL orders can be modified on the web for sure. Can you tell me on which interface you tried modifying your SL for CO so we can try and replicate the problem. The important point to note about modifying SL for CO is that it should be below your Buy price for a sell SL or above your Sell price for a buy SL. After logging in to trade.zerodha.com, I click Market Watch, and choose a share to place a cover order. After placing the cover order, I open the Order Book which is next to Market Watch under “Trade” tab option. After opening the Order Book I see say, my entry Buy Order which is complete and One Stop Loss Sell Order with trigger price which is pending. Even today, it is behaving in same manner as above. Anyhow I used the right most “Exit Cover Order” label today for most of my orders. But please rectify this error. My id is DS3370. P:S: Assuming I buy first and sell later, you comment says I cannot modify my sell order trigger above my Buy Price. Why is it so? If market price has moved substantially higher than my Buy Price, I would like to move the sell trigger to above my Buy Price (Ofcourse, below LTP), so that I will always end up in profits, even if stop loss is hit. Please answer. The SL modification bit works on TradeXpress and Z5. However, it doesn’t work on the regular html version, which is where you’re trying to modify. I’m sure this can be fixed. We’ll report it to our developers and get it done. The part where we should be able to modify above the entry price is not really functional right now. I’d suggest you use the Bracket Order functionality which gives you the opportunity to trail your stop loss. Hanan/Nithin, could you please reply? Thanks for your reply Hanan, please rectify the regular html as quick as possible. sir, i like to use CO. What is trigger price range ? how that act in execution of orders? Trigger price range is the range in which you have to mandatory place your stoploss trigger. Explained in the post above. 1.) where can i see the market price for buying and selling. 1. You can see the live prices on the marketwatch, check this section. 2. If it is the same day, you can seee the prices on the trading platform itself. But from the next day, you can see it on our reporting tool Q. Still waiting for getting BO enabled on Z5. Would make life easier for trading on Mobile!! Do we have a timeline for it? We are pushing our tech vendor for this, can’t really put a timeline for this. Vishy, this is how the product was approved by MCX. We have been pushing Omnesys our tech vendor to get approvals for limit also while using cover orders. Earlier you used to provide a high leverage on CO & BO and now I see you have reduced the margin quite low. For instance buying 1 lot of RCOM future earlier i can buy it if having Rs.5,000 but now when use your margin calculator i see over there that margin required for even buying 1 lot of RCOM is over Rs.10,000. May i know the reason why the margin has been increased for CO & BO as it is of no use if I wish to trade using cover order as its purpose is lost if zerodha not providing higher leverage if trading on your platform using such different kind of order types. Abhinay, the margins haven’t really gone up, it is almost the same. Can you double check. I wanna know is there any facility available in zerodha terminal where I can put the SL and target togther and after triggering any of them the other order will automatically cancelled. Kindly tell me for the below mention scenario. Assume that I bought a stock at Rs 100 and wanna put a SL at 98 and Target at 105. Yes Jishnu, it is called bracket orders, check this post. as this facility is only available on Ver. 3.11.2.1,I have installed NEST trader (Ver. 3.11.2.1) but when I try to login, It shows ‘Log file open error’ and next ‘failed to open mpic config file’. I am using windows 7. The past version 3.10.57.97.7 is running on my pc well. I was in profits since the current market price fell down rapidly after that. What should I infer from your comments above? Is the functionality to modify cover order’s stop loss into profit zone has been added recently? Thanks if it is so. 2) when pressing shift F2 , there is quantity automatically. what is that? is that showing with any logic? 3? when i trying to sell which should be considered ? bid price or ask price? 4) impact of bid quantity and ask quantity in trading? 1. You can use our CO calculator for this. 2. That quantity is most likely because of the F&O lot size. You can ignore, and change to anything you want. 3. While selling bid price, while buying ask price. 4. As long as you are trading liquid stocks it should be okay, there will be enough volumes on bid and ask. But if you are trading Cover orders, since it is market, the impact can be big in case of illiquid stocks. i want to know my used and balance amount while trading. how can i know? any portfolio there? Yes, use the admin positions, also check out our reporting tool Q on an end of the day basis. EXPLAIN CO WITH EXAMPLE OF SHARES OF SBI, HOW TO PLACE RANGE AND TRIGGER.. If SBI is at 2500, the range is automatically shown in the order window. The range would already be shown in the order window ( 2437.5 to 2500, upto 2.5% of the stock price). So when you place CO, you are placing a market order with a trigger to stoploss in the range above. Yep, sell order will be exactly the opposite. If i purchased an options lot at premium 200 and stop loss 180. Premium for the option which i purchased has gone up to 300, at this point i want to change the stop-loss of my position to 250. Is this possible. If possible, what kind of order i have to create. Note:: I am not doing intra-day. Im using Z5 since Ztrader is not supported for MAC. you can change the range from the order book and pending SL order. I guess you are asking for cover orders right? Cover orders are for intraday, so whenever you buy/sell there will be a SL which will be pending in the order book (press ctrl+3, if you are not seeing pending orders). Yes orderbook is valid only for a day as the exchange removes the pending orders by end of the day from the cache. When you have placed a stoploss, it will show on order book in pending orders. Click on the pending order and modify the price. Check this post. SL orders can be modified on Z5. The important point to note about modifying SL for CO is that it should be below your Buy price for a sell SL or above your Sell price for a buy SL. You cannot modify it above your entry price if you have bought. I’d suggest you use bracket orders instead if you wish to trail your SL but this facility is available only on Zerodha Trader. We’ll try and have it available on Z5 in the near future. 2. how frequent the list will change? 3.any download link for that list? 4. does all the brokers gives the same scrip for cover order? 1. For now, you will need to see the cover order calculator. Also, typically all stocks on this list will also be enabled on cover orders. 2. Unless a particular stock becomes very volatile, the list remains the same. 3. What I have given in point 1. 4. Hmm.. the list might vary by a bit, but I think broadly most brokers offer higher leverage on the same list of stocks. This is plain wrong you can keep the lower limit as it is but allow the user to enter close to the current price. Why force the user to keep stop loss at entry price. i am struggle to calculate the balance amount after making one CO order. how can i know? if i short sell a equity scrip using CO then i want to make an CO order using my available full balance. how can i calculate the quantity that could buy using the balance..
Will bounce this suggestion with the tech team. I don’t want extra leverage, i would like to trade with the normal margin, but i would like to place a limit buy order with a defined stop loss. Once the buy order gets executed, the stop loss should be automatically placed. Is there a way to place such an order ? (i know of bracket order, but that is only for intra day and gets squared off at the end of the day). Not for now Kartik, exchanges in India remove all pending orders from cache everyday. So hence it is not possible to have the SL option kept open for overnight position. Hmm.. Let me speak to our technology vendors and see if something can be done. Yep, get your point, unfortunately not possible now. I guess the only way you can run this is by using the basket orders Check this out . Kindly let me know whether we can place stop loss above or below the upper circuit or lower circuit in CO.
Example- Nickle upper circuit is 955 and i want put a sell CO with SL 955.10. No, orders aren’t accepted by the exchange below and above the lower/upper circuit respectively. sir while trading i found that sometimes the bit qty and ask qty were in high count. specifically after 2 o clk the qty shown were in hike. today i buy and sell cover order. while exit the CO i thought that the sell price wuold be a value but that was not actually.. i missed the expected price but less executed less than the price. buy price=369.70 ; aimed and exited sell price= 370.10; but the executed price was 369.85. what is te reason for the my missed target price? the qty hike? or else? yes Sabari, when you place a market order to sell, if there are not enough buyers at a particular price it will get bought at the next best price until your complete order is executed. So it is best to trade liquid stocks to avoid this, which is also called as an impact cost. .But sir, at that time the bit qty was 38000 and ask qty was 68000. So the availablity of the request to buy stock was high i think..am i correct? 1. In cover order can we change the Intra position of a stock to delivery? 2. I am using version 3.11.2. Bracket order is not enabled in my trading platform. 1. No, you will have to square off the cover order, and then enter a fresh position to hold overnight. 1. In equity once the cover order is executed can we sell partially the stock. 2. In Nest trader I am not getting an option to trade in Pre opening session. If that is possible to trade in Pre Opening session can we enable the option in Nest Trader. 2. You can’t really trade in pre-opening, you can just place orders. Check this post. I wanted to know, if I open a buy CO e.g 1 lot of “stock A” at 100 and SL is 98. Now after a while I want to ensure, where the price hits 104 my position should be squared (BO has the square option); How do I achieve it, as order type has to be same. will it work fine if i create another CO e.g. Sell 1 lot of “Stock A” as limit for 104 and keep stop loss as max as possible. Will this square off my position of create another one. or is there another way to achieve this. Also while using BO, can I modify profit target or that is one time. 1. In CO/BO, if you place another order, that won’t square off the first one. It will create another. 2. To exit, in case of CO go to pending orders and modify/exit the pending SL order. In BO, modify the target. 3. You can modify target in BO. Thanks, so is it possible or anything in pipeline to add strategy for exiting CO at a target price. It won’t take a 2 different positions, it will be as if it has squared off the first. But don’t do it this way, if you want to exit a bracket order use the exit option as explained in the blogpost. We provide Brackets on only liquid stocks, and all such stocks trade on NSE. So no additional benefit of offering it on BSE. In cover order, it will be considered as 1 transaction for buying and 1 transaction for selling. In Bracket order, since everytime a trade happens a new SL and target is placed, your entry will be considered as 1 transaction for brokerage, but your exit will have 10 different SL/Target and hence brokerage will be considered as 10 separate transactions. Check this post for bracket. what is going.. i made CO ORDER yesterday at 12.05pm.. i sell and wait to buy ..and the right time i click exit to buy the order.. that was not executed and also that show as SERVER NOT READY. adn now your canditate is telling me that my order going to be a auction order T+3 days.. what will happen..this is your mistake .. why should i fall into accept loss, if it will be..
what if i invest large amount..? think zerodha.. and i am not well about auction market.. totally upset..
Best you speak to the support team on this. hi, in cover order ,i placed a order for buy in market price & placed target & sl also. if my target is achived, then my sl order will cancel automatically or i have to do it manually. In cover order, you can’t place a target, you can only keep a SL. To exit a cover order, you need to use the exit option, so basically your SL gets converted into an exit order. Explained in the blogpost above. what you are looking for is brackets, check this post. hi now nifty 8359 i want to trade option JAN-15 SELL NIFTY 8900CE & SELL JAN-15 NIFTY 7900PE HOW MUCH MARGIN REQUIRED? You could use our SPAN calculator, it is down currently because of the server upgrade. But margin benefit will be between 10 to 15 %. So if you need 50,000 to take both the positions individually, if you take them together around 45000.
if i leave my intraday order to auto squreoff, when will it be done. exactly at 3:15 ? is there any considerable point to note while leaving an order to squreoff? It can be anytime between 3.10 to 3.25pm, but most days it will be around 3.20pm. My first email in Zconnect. First thanks for great brokerage. I am about complete 1 year @ Zerodha in January. Own 2 60 day challenge. Regarding problem faced at dealer terminal. Dealers limit is made “0”. This is very odd. I feel somehow all these IT upgrade is costing traders dearly. I think we require S/W delivery system which is transparent to us or make these changes at year end or october- november time when there is lot of holidays. Typically when volatility increases and you need to upgrade S/W and infra is a bad idea. Yesterday my turnover was highest so far. Today I could not trade because of issue. It cost me huge profits in the market. Please give it a thought , these issues can be solved. its not vendor issue, its infra deployment issue this time. Sorry about any inconvenience caused Nagendra, we had taken time to test/implement this upgrade. But yeah, could have been done better I guess. Btw, are you facing issue on NEST? NEST/ZT has been running normally without any issues. I can get someone to call you and check if you are facing issue with NEST. Congrats on winning the challenge. 1. both entry and exit is on MKT price is it? 2. when it comes to brokerage and other charges (STT for example) CO order is calculated differently? 3. I use web version, trade.zerodha.com, where trigger price is stop loss is it? 4. in web version, to exit, need to use the “Exit CO” in order book, is it? Can we use SLM to enter as in if ltp is 100 place SLM at 105 for cover orders? 🙂 , you can open an account by leaving your contact details here. Please i apologize sir i humbly request you for kind hearted person plz i want to your help to win the trade over our lost capital, Rs-4,5 lakhs in 4 years trading by many advisers and tips but can,t cover my loss and failed all my efforts. I am 56,yrs and i want to from you to winning trade idea [formula] i could not find the right path so for if you help me i will be a great thankful to you. Many many thank, sir Lal ji saxena, from Delhi, contact,no is -9899815321. As I only intend to help the dedicated zerodha team so pls let me know under which name I shud prepare the DD for Rs.50 Lacs & courier it to your banglore office before I take my last breath so I can peacefully rest in heaven. I have acount in zerodha I am Arbitrager in cash segment i am buy and sell both segment nse and bse i am trading those stocks have like Mohit Ind, INFINITE NELCAST EASUNRY, u provide me extra limit. i have 10K Credit in ledger can you give me 10 times or 5 times limit intraday. We give intraday leverage only to the list of stocks mentioned here. The risk of giving leverage on stocks that you have mentioned is quite high, especially considering that they can hit circuits very easily. Dear Nitin, I appreciate your efforts to provide us better tools and more leverage such as this – cover order type deal. But my experience with it tells me that it is more a tool to fleece money from small traders than an opportunity to do more than trading with high leverage. I don’t want to sound biased in anyway, but truely speaking I have been experiencing this for a long time. My experience last week was specially bad and shocking. I was trading Jindalstel Future which is quite a volatiel scrip. At one point it was going up. I had a bought it at 150.2 with Stoploss at 148.5, scrip was at 151.1. Suddenly I saw it fell down to 149.2 and then rose again .. and I was comfortably profitable again. But to my horror, when I checked my margin away from chart (as I was focusing on amibroker), I found that my scrip was already sold at 148.5 .. while on chart the scrip nowhere touched that point or even went below 149… lowest point it went was 149.2. I had even called Zerodha to seek explanation but got the stock reply that it was done at exchange and they cant do anything about it. Second time, I was trading the same and had a sell order. Scrip was going down at 152.4. My stoploss was 153. Suddenly jindalstel moved up two point and reached 154.8. I found that my trade was not squared off at 153 with a loss of just 0.6 points but rather it was traded at 154.8 only and I suffered the huge loss @Rs 2.4 per scrip. I had shifted to Zerodha with a trust that I wont be cheated here. Can you please enlighten me as to why such things happened and how to avoid them? Otherwise how can we ever trade profitably if such things keep happening again and gain? Manu, contracts like Jindalstel are not very liquid, so it is very easily possible that your SL got triggered. Check this, I have explained on why sometimes you might not see the price on chart, but SL can still get triggered. MCX is yet to approve this. Today, 21 AUG, 2016. Is Bracket Order now available for Commodities in MCX? Rakesh, this hasn’t yet got MCX approvals. I’m planning to place cover order and manually trail the stop loss however there is an issue in this. I place a buy order at 100, the stop loss range is 98 to 100. Order is executed and the same contract trades @ 110 after some time. Now I want to change the stop loss to 106 however the system does not allow me to place the stop loss anything above 100 (the range when I entered the trade). Is this a system issue or is there something I am missing? Yeah, the way the product is designed, it doesn’t let you trail in a cover order. Is there a possibility this can be changed and users are allowed to trail manually in a cover order? To me this seems bit silly on Exchange/Regulator’s part as the trader has the required margin and making profits, why not allow him to protect it? Sukesh, Cover order is designed by our tech vendor Omnesys, and they have gotten approvals from the exchange. So when they have gone back to modify, it hasn’t been approved. We are working on this. Do you allow cover order in natural gas. Please confirm the CO cost as on date. Thanks. CO doesn’t cost anything extra, yes allowed on Natural gas. Check this for margin requirements. Can you explain how is CO giving more leverage than MIS in the below example in Option trading. I have 12 lac in my account and I want to play intraday(either MIS or CO) on RELCAPITAL on the expiry i.e. 29th Jan.
Is Covered Order (CO) blocked today? What could be the reason? Yes it was blocked during the budget, in case of any extreme volatility. It is available now. Cover order is not the right blog for my query. Sorry for that. Can I place an order which will be valid till it get executed or defined number of days is expired – which ever is earlier? e.g. at this moment ITC is trading at 340; but I want to buy 1000 ITC @325 and I want that order would be valid for next 15 days. Arnab, NSE doesn’t accept Good till cancelled orders. But we at Zerodha are working on a way to be able to offer this. Give us a couple more months. in CO , Once one leg is executed [say Buy order], is it possible to modify the trigger price for pending sell order? So that we can make it as SL-M.
Kumar, CO the pending sell(SL order) is always a SL-M order. You can’t modify it from SL-M to normal SL. Thanks..But can you guys something so that we can modify the trigger price once trade get into profit? Forgot to mention,as long as price is within the range i don’t think it will affect the main intention of cover order. Cover orders will be available on the mobile platform very soon. For now, you have to use Z5 to place cover orders using your mobile. No cover order is not available on the plugin. can we place the cover order with limit price if no why ? Aniket, no for now. The cover order product was approved by the exchange as a market order. You can use bracket orders. in bracket order, once the order placed, and after completion of that order can we modify the target ? Ashish, these are the list of stocks on which BO/CO are allowed. Ashish, CO and BO are products which have higher leverage, and we are allowing on stocks which doesn’t have any circuit limits. The stocks you have mentioned all have circuit limits, which could mean SL not getting triggered at all. Kindly clarify. At least this facility exists in MIS order? If I can not trail S.L. in cover order in Pi,I will switch back to Nest if available in it. Vasu, for now on PI you can modify the the SL within the initial price range. On NEST, you can modify outside the range if price moves in your favor. We are working on having this fixed on Pi. On clicking modify in order book and then in sell order (with in range) modification not effected for can bank future and in order book trigger pending value didn’t change. Tried many times on last Wednesday and Friday and had to exit on both days with loss of profit of couple of thousands due to this. In sell order product name did not appear normally but in semi hidden form.I had clicked trigger pending scrip first in order book. Problem in Pi or …. Vasu, will ask someone to call you back and have this checked. The only issue with CO on pi for now is that you can’t modify SL outside the trigger range. Above entry price within range not able to modify so no locking of profits! !Any way range is up to CMP and no body modifies SL at or above CMP as SL will be hit!! The reason you feel the margins for F&O are much higher is because F&O is already a leveraged product. Eg: Nifty Futures contract value (Nifty @ 8855.45) is 2,21,386. If you want to carry forward this position of 1 lot of Nifty, the Exchange asks you for a margin of Rs.18000 which means you’re already leveraged 12 times (221386/18000). For BO/CO orders, margins are normally 1/3 of the NRML margins, which means the leverage would be close to 36 times. This isn’t the case with Equities which are fully paid. Yes on ZT/NEST. (but if u r using Pi, currently not possible on that). Ashish, if you want bracket to act like a market, just place a limit buy order with a much higher market price or limit sell with a much lower price. It will act as a market order. When we can expect modified stoploss can be placed above our buy price in Pi software. Hopefully by the next release. Latest patch allows stop modification above buy price?? Missed ur query, no not yet. We are working on making it happen by the next update. I want to trade through Covered Order, just want to do a thing differently that I’ll place buy/Sell is SL-M position (Not in market position until the perfect signal come) immediately trigger it in SL-M position. Time Target will be 3.20. Is there any option of placing a SL-M order with cover/bracket ? No Rishi, entry is as of now only via market on Cover, and limit on Bracket. Ok, is that something in the pipeline or its some policy issue ? It is a technical issue, the issue is with having two stops at same time (one for entry/one for exit). So the product has to be redesigned, we have gone to exchange for approvals, but this will take some time. May be my query is not related with the Post. Where I can check/calculate the margin required for a MIS/CO Intraday Sell order for any stock. The margin calculators have option to calculate only buy order. https://zerodha.com/margin-calculator/BracketCover/, there is an option to select buy or sell (just above calculate button). dear sir, in f&o lot limitation is 7500 if i would have more than 7500 lots then if i will square off my postion on markit price order do i need to put 7500 quantity there or alll lots will executed in single order.and what is quantity buy or sell limit in equity.thank you sir. Tarun, the freeze on Nify lot size from yesterday is increased to 10000. If you want to buy/sell more than 10000, you will have to do in multiple orders, not possible in one order. In equity the limit is Rs 2crores worth of stocks. sir in new PI Release on 11 May 2015 can we modify a CO above buying price ie if we buy some script on 100 with co 95 & after when script on 105 we modify co on 102 means above buying price . IN CO ORDER IF WE WANT BUY/SELL SCRIPT ,THE ORDER WHICH WE KEPT TRADES AT MARKET PRICE, BUT I CAME TO KNOW THAT IT IS POSSIBLE TO PLACE ORDER AT PRICE() ORDER ALSO (WHERE WE WANT TO TRADE SCRIPT AT PARTICULAR PRICE) WHICH IS AVAILABLE WITH SOME OF BROKERAGE, IF IT IS POSSIBLE PLEASE DO MODIFICATIONS IN OUR ZERODHA NEST ALSO AS IT IS USEFUL SOMANY TO TRADERS LIKE ME. This is with reference to Nitin’s post in Trading QNA that you can manually modify the stoploss in cover order when the trade moves in your favor. In Pi platform, I am able to change the Stoploss for Cover Order only once. Not after that. I usually use the Cover order with the default trigger settings and I then modify the trigger price a little later. I am unable to modify the trigger price when I try another time. Is this a system limitation? Would like to modify the trigger prices for Cover Orders in Pi. so that we can manually trail the stoploss for Cover orders. Would like Nithin to confirm, if I am doing something wrong, as the Manually Trail doesn’t seem to be happening in Cover Order ( in the Pi platform). Yes like you said, the current version of cover orders on Pi, you can’t manually trail it. The next release of Pi should have a fix. Thanks Nithin, will look forward to the next release of Pi for the fix. The Pi update that was released yesterday does not have the facility to manually trail the Stop Loss for Cover Order, yet. I am able to alter the Trigger Price only once. Not after that. I hope Nithin has not forgotten his statement of 02 Jun 2015 in this thread above, promising this feature in the next release of Pi. I will have to now hope it is in the next release. No AAP, not forgotten, we will have an update in the next 7 to 10 days hopefully with this fix. For Cover order some of the F&O scrips which are not available. Like Engineers India, KSCL, Wockpharma, Pidilite Industries, SRF, etc.. Please add those scrips also in Cover Order. It would useful for us. Nithy, stocks which have lesser liquidity, it is tricky giving CO on those. Risk management becomes tough when market moves. It works just the same way as equity futures cover order. If there is any specific query about this, do ask. Is there a minimum amount required in the account for placing a cover order? I place cover orders using Pi. I was trying to place a cover order using Pi with around 12k in my account but the software did not place my order. Please clarify. I should have put it this way.. In the morning hours it works fine…but after around 2:30 pm -2:45 pm, No cover orders are being executed on Pi. This happened today (18/06/2015) as well. so, is there a time limit after which the system stops executing cover orders? or is it a bug? Hmm.. will get someone to call you back. Cover order don’t work after 3.20pm, but shouldn’t be any issue before that. Orchid Pharma : 200 Nos. Federal Bank : 175 Nos. HCL Tech : 10 Nos. I want to do intraday trading (Cover Orders) against the margin available against Federal Bank and HCL Tech. Orchid Pharma margin is not available on your list. As per today’s stock value, Federal Bank and HCL Tech are worth are around Rs 34,000/-. Can I place cover orders using the available margin against these stocks? If so, what is the margin amount I get for trading. If you pledge 34,000 after haircut you will probably get around Rs 27000 as margin to trade. Note that this margin can be used only for futures trading or for options writing/shorting. Yes you can use cover orders with the Rs 27000 that u get. A Stop profit order would typically be a price at which you’d want to exit a position favorably which would be the same as a limit order. what is the square off time of CO is same has been placed in MCX Commodity. as you mentioned that all the co will gets SO at around 3.20 Pm but what for commodity ? is the time remain same for both Eq. Future and Commodity Future.? is yes then its my recommendation not to use it for Commodity. CO for commodities is 30 mins prior market closing. When the Commodity markets close at 23:30, CO orders are squared off at 23:05 and when the Commodity markets close at 23:55, CO orders are squared off at 23:30. Is there any other way to get out from cover order when price moves in favor? or should we need Exit from Order Window? it will cause price fluctuation in Existing then Expected. so its bit risky for the Low Profit trader, Is it? Hitting the exit is the only way out for now. Any plans for introducing MCX and CO in Kite soon? Yes, in the next couple of weeks. Bracket trading and trailing stoploss are available on the nest trader the phone app? Manu, BO & TSL will take a while before it is available on mobile app. I was thinking if i use Cover Orders for Equity Futures , and after the market goes my way can i move the initial stop loss to a price thats near the current market price, to protect the profits. Or would the SL range be locked to my initial buy entry price. In which case it wouldn’t be possible to trail the stop loss using the CO feature. Yes, you can manually move the stoploss if the price moves in your direction. Can add SL cover order for mobile app.? I apologize in advance if this is a lame question. Just to clarify, should the stoploss be within 1.5% or can we place as we wish and leverage will be given as per my stoploss placed (as can be observed in the Margin Calculator for Bracket/Cover orders)? I find few stocks are not available in the calculator, does it mean i can not trade on them using Zerodha and i can trade only on those specified in calculator (for cover orders, to get leverage)? Hello there, Yoou have done a fantastic job. I will certainly digg it andd personally suggest to my friends. How to place market buy order with trailing stop loss and target? Market buy order is currently not possible on brackets. But what you can very easily do is, if you want to buy at market, send a limit order for buying at a much higher price. Sir I want to know if we exit Cover Order, then do we have to cancel our Stop Loss order manually or we don’t have to worry about that ? You don’t have to worry, the SL gets removed automatically. Could you please allow margin trading for the following stocks JubilantIndustries,SOBHA,OBEROIRLTY,INFRATEL,BERGEPAINT,DHFL,IBULHSGFIN,JETAIRWAYS,CEATLTD. I appreciate you efforts in empowering small investors in many ways! I have one request from my side. Currently, CO is allowing only market orders. However, I would be excited to have limit orders as well. For example say XYZ stock is trading at Rs. 100. However, I am interested only to buy at Rs. 95. Due to my office work, I cannot monitor the stock whole the day to buy it at Rs. 95. So, what I would like is I place a limit order for Rs. 95 while specifying the SL percentage in the prescribed range. So, when the I get the stock, a SL order is also placed automatically as per the specified SL percentage. In fact I want to trade in commodities. Unfortunately bracket orders are not available there. Buy CE at price 120.Sell this at 125 with 115 as SL. Please give me the entries for buy and sell. 2.Can i buy ‘normal buy’ at 120 and for selling I place a CO? 3.Is Brokearge same for CO like 20+20+brokerages? 1. In CO you can’t place a selling order. You can place market orders with SL. Check the post above. 3. Brokerage is just 20 for buying and 20 for selling. Can we put cover orders on Kite? Also waiting for BSE stocks to be enabled on traded on Kite. In my opinion Kite has a very smooth and uncluttered User Interface. Its like Google Chrome of Browsers. Cover orders and BSE will take a little longer. Thanks. Thank you for nice feature CO & BO. It will be appreciated if Cover Order can be placed with Limit instead of Market, and for square off also (Take Profit). Stop loss limit range will be calculated as : For fresh order – as per given range, for modification of order CMP to other side of range. Suppose CMP is 150, Then User can able to modify SL between 105 to 150. Finally in Exit Order, User can Place Limit Order (TP -Take profit) to book profit at provided level. Yep, we are working on getting this approved at the exchange. Can CO be used for Stock option trading also intraday or just index option allowed.I know that for BO stock option trading is not allowed. CO isn’t available for Stock options. If I trade in crude and I buy at 3040 and then place an exit order at 3050 and stoploss order at 3030 from pi chart what type of order is this a BO a CO or a normal order? Just a normal order. If either sl or exit hits, you have to manually cancel the other. On Pi, are cover orders not enabled on bse? I tried to place one today but it got rejected. They are enabled, but if you are trying an illiquid scrip, it may not work on BSE. I am not able to place cover order for any stock on bse. The order gets rejected. I called up you guyz. The response was that it is currently not being allowed for any customer ant not just me. Is that correct? We cant place cover orders for any bse stock. I am not even able to open up bse chart. It shows up that historical data is currently not available and only live data will be available and a blank window pops up on clicking ok with no candlesticks. This happens for all stocks on bse. The guy told me thats an issue on pi that will be resolved in 10-15 days. So we cant place cover orders, we cant watch the chart of bse stocks?? Yes Manu, currently we don’t have historical charts for BSE stocks or have cover orders enabled on them. All stocks which have cover order enabled on them are also available to be traded on NSE. You can check your trade book to know what price the trade got executed at. Do I need Demat account to place CO in equities?? Even if you haven’t opened a new demat with us, you need to have some demat mapped to the trading to place trades on equity. What’s the logic? COs are strictly intraday n they cannot be converted to NRML.. Isn’t so? Exchanges came with a notification that if no demat account is mapped to a trading account, no equity trades should be allowed (even if it means only intraday). I guess the logic is that if a stock hits circuit down and the person is not able to exit, demat will be required. A question. Suppose I buy a lot of a futures using CO and buy another lot of the same after few min. Do they get averaged or treated as separate trades. If averaged what will be the SL. They will be treated as separate trades in terms of SL. But your overall position will be shown as an average. I am new in this field. Anybody can explain difference between Future and Option in Equity. You can register yourself to learn more about F&O trading. The entry orders for cover orders is a market order. You cannot place limit orders. Its more a technical limitation since the SL has to be determined for cover order when it gets executed. Also if the limit order gets executed partially, SL has to be placed for the same quantities. Which is the latest version of PI? How much credit for future deliver we can trade in any segments. We don’t give any credit if you are taking delivery of stocks. I would like to know if we can modify the cover order with stop loss in commodities by squaring off at market. When I do, it says not possible. Otherwise what is the option to square off when the price is in our favour . If we are unable to square off stop loss get hit after a while making loss. Click on the pending stoploss order in the order book, and hit on the button exit. This will square off the position as market order. Sir I want to know can I target a price in normal, for option trading to take profit and hold it for 4 to 5 days.Second thing if I deposit rs 20000 in zerdhas account how will you come to know that I have deposited or I have to inform you. Mushtaq all orders are day orders. All pending orders get cancelled end of day. When you transfer, you either do it through the payment gateway or NEFT/RTGS, in both cases we will know the bank account from where it came. Through this we will know the client ID also. If you don’t square off MIS, it will automatically get squared off by our risk management system 20 mins before market closing. Check this post on SL. Based on the SL, we give leverage for writing options in case of cover order. The closer the SL to the price, the higher the leverage. But allowed only on writing nifty options. I’M NEW TRADER IN UR BROKERAGE HOUSE.PLZ. HELP ME OUT HOW CAN I SEE LIVE MARKET WATCH WITH BEST BUY,BEST SELL,LAST TRADE,TOTAL BUYER,TOTAL SELLER, VOLUME ETC. Check the Kite and Pi section here. Kite is the web based platform, Pi is the desktop. Are cover orders and Bracket orders available for all stocks? Is there any option for Margin buy? Do you mean margin for buying delivery stocks? If yes, then not yet. Then what will be my position ? 1) is it 100 sbin short at weighted avg price? 2) is it 100 long sbin @170 and 200 short position @ below 169 ? 100 long sbin @170 and 200 short position @ below 169… Since it is two different product type, it will be considered as two separate positions. Can you tell how to place Cover & Bracket order in Kite web version. When we buy or sell it shows only Normal and MIS option. Currently CO and BO not enabled on Kite web. Give it a few more days, it will be available. Until then you will have to use our desktop version Pi for this. Kindly hint the ETA. It’s been months not days. Today i take trade using coverorder with sl trigger price @ 2519 but it showing me average selling price @2514 unnecessarily i loose more 5 point it should trigger @ 2519 my buying price was 2541.40 in heromotocrop please resolve my problem…. Check this blogpost on how stoploss orders work: http://zerodha.com/z-connect/tradezerodha/zerodha-trader-software-version/stop-loss-orders-limit-market. A trigger is when SL gets activated and market order is sent to the exchange. If it is a market order in a falling market, the price could be anywhere. Possible only on Pi/ZT, and very soon on Kite web/android. Can you provide approx timeframe when CO will be available in kite? It’s near impossible to trade CO from mobile. Hoping int he next 2 weeks. Btw the beta of our android is out (it has CO and BO). You can send an email to [email protected] to get access. How do I place CO order in Kite? I’m able to do it in Pi but unable to find the option in Kite..
CO is still not enabled on Kite. Can you pls enable F&O leverage on kite.zerodha.com … in office PC, not able to install any software. Cover orders will be there soon on kite. Today i had traded JETAIWAYS FUTURE. BOUGHT 1 LOT AT 538.35 WITH SL OF 530.
at 12:23:43 price came down to 530.20. and my SL got triggered. It didnt gone down below 530.20 then how can possibly a SL of 530 got triggered. ????? Fraud from Zerodha. going to file a complain against you. Zerodha only provides you an execution platform. The orders are matched by the Exchanges and they wouldn’t have matched the order if the price wasn’t reached. I am unable to square off cover order in commodity, Can we square off position manually or either the cover order will hit SL or will be automatically squared off at the time of exchange closing?? You can square off by clicking on exit on the open SL order in the order book. If you do nothing, it will auto square off. how can i place Cover order in basket Order (Browse upload) ? Not possible to place Covers using basket. we place order at 3:25 pm if it is pending upto close the market.Then any ways to carry forward same order on next day opening ? No. All orders get cancelled by the Exchange post market closing if not executed. Thank you for giving update in kite ANDROID app.CO is enabled but BO NOT ENABLED.most traders want BO than CO which is most helpful.I hope you understand the issue.do the needful at the earliest.all the best Zerodha. You are the industry leader. We’re working on it and should have the BO up soon. Why is it that I have to always choose market price for CO. Why cant I choose limit price? How soon CO will be available on Kite and mobile version. Is arbitrage allowed for cover orders? Or for any other type of orders? I didn’t get what you are trying to ask. Recently only I started doing Cover Orders. Entry into a selected stock at 9.15AM is difficult, as on opening itself, one find most of the stocks moved up or target surpassed. Do you have any tips to offer in this regard? Hmm.. unfortunately nothing can be done about this. 1) In Cover Orders, is it possible to buy from BSE and sell in NSE, to take the advantage of price difference. 2) Similarly is this allowed in intraday orders and CNC orders?